While WUWM is spending the week exploring Wisconsin’s political climate in our series, Project Milwaukee: State of Upheaval, the state elections chief came to town. 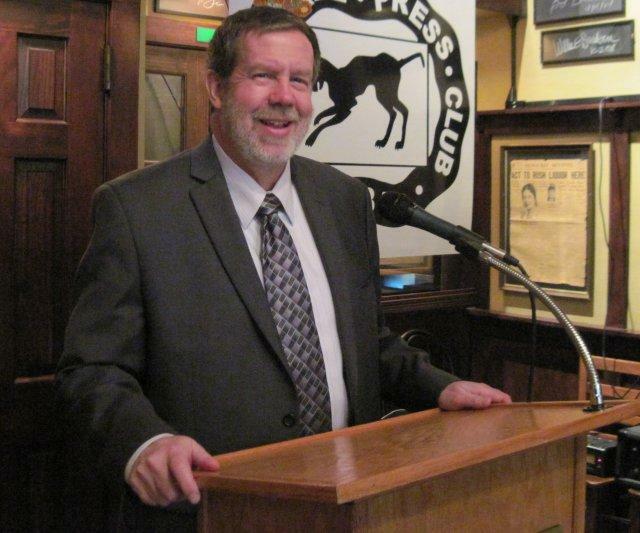 Government Accountability Board Executive Director Kevin Kennedy spoke to reporters Wednesday at the Milwaukee Press Club. WUWM’s Marti Mikkelson had an opportunity to question him about this unprecedented year of recalls and new voting rules. Government Accountability Board Executive Director Kevin Kennedy. During his Milwaukee visit, GAB chief Kevin Kennedy joked about 2011 being a year of firsts. “It’s been a long time since I’ve had kids watching Sesame Street but I can tell you that this political season is brought to you by the letter R. That would be R for recall, recount, redistricting, requirements for voter identification, reducing the hours for absentee voting and writing your name on the poll list,” Kennedy says. Kennedy and his staff are preparing, in case they must pour through thousands of signatures in a recall underway against Gov. Scott Walker. Organizers must turn in more than a half-million valid signatures by Jan.17 to force a recall election. The board voted this week to seek an extra 30 days to review the petitions and hopes to hire 50 temporary workers. Kennedy says the staff could have to review as many as 1.5 million signatures, factoring in the gubernatorial recall along with the recalls against four GOP state Senators. “As stewards of the public money and the responsibility, we need to tell them we’re not just waiting for something to land. I’ve had staff out there looking at office space saying, what is a good secure location for this,” Kennedy says. Kennedy says the process will be open and he won’t keep the location where staff would verify signatures a secret. He says he doubts the office would need ‘round the clock police presence, but he would call authorities if necessary. Kennedy debunked accusations from the Walker campaign that the GAB will accept false names such as Mickey Mouse unless there’s a challenge. “You have a circulator out on the street. They’re signing a statement saying I personally obtained this signature, I know who signed this signature so they’re probably going to take care of any fictitious names. If we get a petition that has seven Disney characters on it or the Dallas Cowboys or famous quarterbacks in the NFL, we’ll flag those and then we’re going to be focused on that circulator because now they have violated the law because they’ve allowed that to come forward,” Kennedy says. Kennedy predicts it would take several months to complete the verification process and there would likely be court challenges. So the earliest he anticipates any recall elections would be late April, but more likely in late May or June. Another hot button issue he discussed at the forum was photo ID, a law Gov. Walker signed requiring voters to present photo identification at the polls. Kennedy says he was not surprised the American Civil Liberties Union this week named him as a defendant in a suit challenging the legality of the law. “We will defend it. That’s our job. Our responsibility with the law is to administer it the way the governor and the Legislature gave it to us. We’ll work with the Department of Justice and have them represent us in this case,” Kennedy says. The law is scheduled to take full effect for the February primary elections. Kennedy says he does not anticipate a lot of confusion at the polls because the state has phased in the changes.